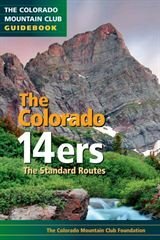 The most colorful, up-to-date, and accurate 14er guidebook on the market. • Descriptions of the standard routes that 90 percent of climbers use. • Stunning color photos of the 14ers by noted mountain photographer Todd Caudle. • Color maps of the routes and sidebars of interest to 14ers climbers. There are 54 peaks in Colorado that rise above 14,000 feet. Climbing 14ers has become a favorite activity of locals as well as climbers from all over North America. In fact, more than half a million climbers attempt at least one Colorado 14er per year. These standard routes are primarily walk-ups, but be aware that fourteen of these routes are rated as “very difficult,” and may involve scrambling. The routes often have a moderate approach through forests and across streams followed by steep to very steep routes to the summit that often involve a good number of switchbacks and slogs through scree fields. Organized by mountain range, The Colorado 14ers is a basic guidebook written in clear, concise, non-technical language with a certain amount of wit. New to this edition are notes by historian Walt Borneman on how each peak was named and who made the first ascent. The photos for this edition are by Todd Caudle, whose work had been featured in the Colorado Fourteeners calendar. Each route description includes precise directions for driving to the trailhead and tips on where to park in addition to the route description itself. THE CMC FOUNDATION receives, administers and disburses tax-exempt funds to unite the energy, interests and knowledge of the students, explorers, and lovers of the mountains of Colorado.